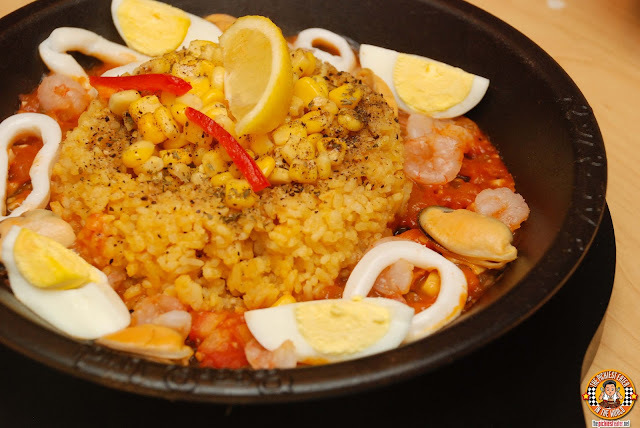 THE PICKIEST EATER IN THE WORLD: PEPPER LUNCH PAELLA FESTIVAL.. AND A GC GIVEAWAY! Often thought of as a "Sosyal" dish, Pepper Lunch manages to capture the vibrant flavors of Paella, but with the sizzling Pepper Lunch treatment that it's long been known for.. All affordable prices! 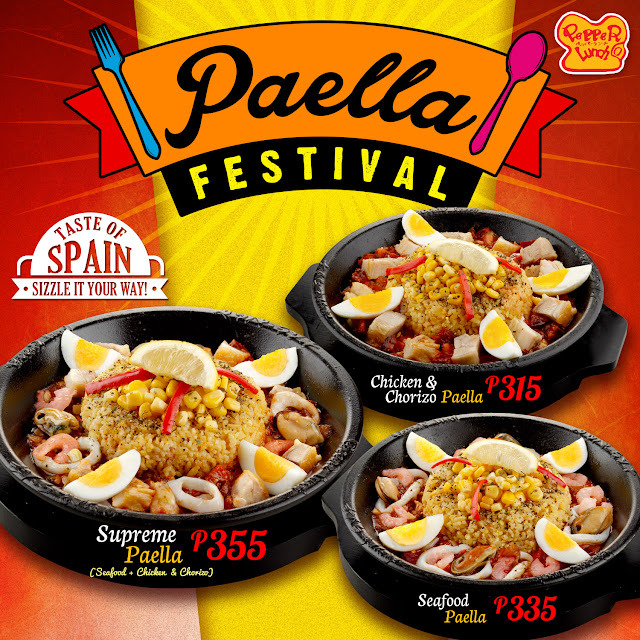 Pepper Lunch's Paella Festival Series comes in three different variants. including the Seafood Paella (P335). Resting in the center of your sizzling stone plate is the familiar Pepper rice topped with golden corn kernels. 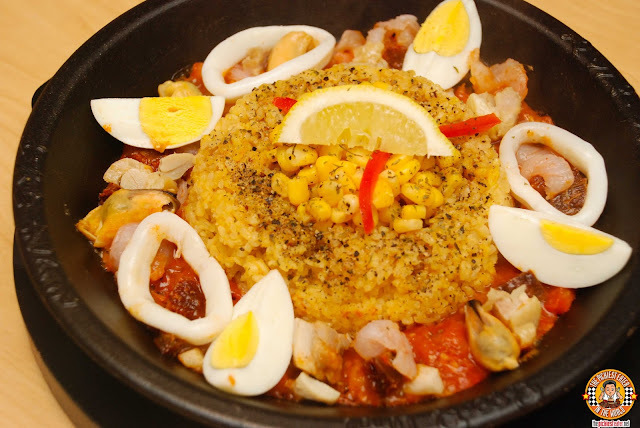 hower, running along the sides encircling the rice, are a medley of fresh seafood, such as shrimp, squid and mussels, all laying on a robust tomato sauce bed. Completing your Paella experience are hard boiled egg slices, and a wedge of lemon that you may drizzle over the rice if desired. My personal favorite, was the Chicken and Chorizo Paella (P315). The combination of the juicy chunks of chicken, and the remarkably flavorful bits of Chorizo was amazing, with the corn topped pepper rice giving it the definitive Pepper Lunch Stamp. If you can't choose between the two variants, you could opt for the Supreme Paella (P355)! The Supreme fuses everything you love about the Seafood and Chicken and Chorizo Paellas, into one, ultimate sizzling Paella dish! Think of it as the "Devastator" of the Paella Festival (Transformers Geeks will get it). 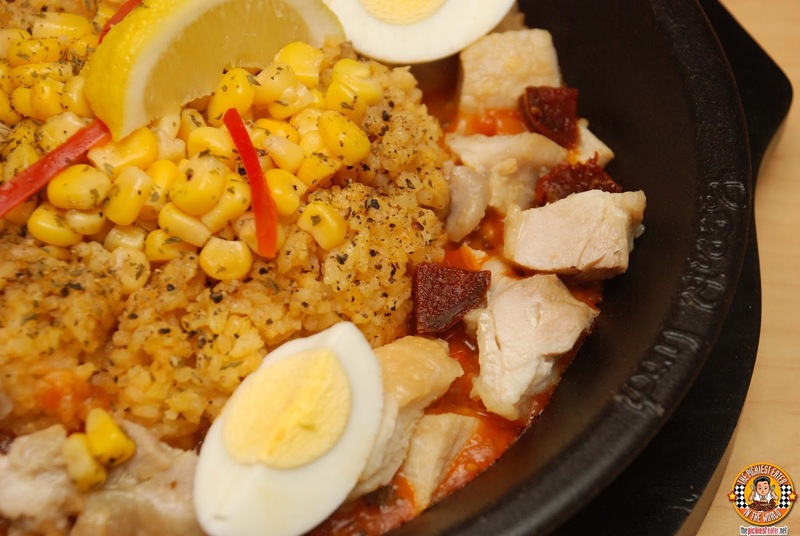 Pepper Lunch's Paella Festival is available until the end of October! So check out the Pepper Lunch Facebook Page for the branches nearest you! THE PAELLA FESTIVAL FOR YOURSELF! for further information on how to claim your Gift Certificate! Which "Paella Festival" Dish are you excited to try? - I would love to try the Supreme Paella to sample the goodness of both chicken&chorizo and seafoods! I would love to try Supreme Paella, Seafood and Chicken plus Chorizo looks delicious can't wait to taste it. I want to try the Seafood Paella! I'd love to try the Supreme Paella! I would love to try the Seafood Paella! I would love to try the Seafood Paella. I would love to try the Supreme Paella pls. I'm excited to try the Supreme Paella! I want to try all of them, so it's the Supreme! Seafood Paella of course! This is so exciting! I would like to try Chicken & Chorizo Paella. 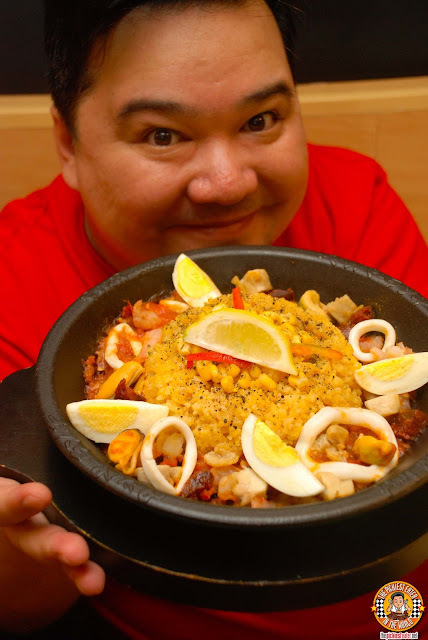 I will be happy, greatful and excited to try Pepper Lunch`s Supreme Paella! Wohooooo! I really really want to try the Supreme Paella! It's absolutely looks deliciously with everything in it! Yum! Mine is Chicken and chorizo paella! Im excited to try the Supreme Paella! I want to try Seafood Paella ! I like to try the chicken & chorizo Paella! I would like to try the chicken & chorizo Paella! I want to try the SUPREME PAELLA! I would love to try the SUPREME PAELLA. My mom loves Paella so I'll bring her to the nearest Pepper Lunch branch preferably in their newly opened store in SM north Edsa. Im craving for the ultimate paella dish. Would love to try Supreme Paella! I am excited to try Supreme Paella. I'm most excited to try their Seafood Paella! I would love to try the 3 paellas since the P1000 gc is enough for them!